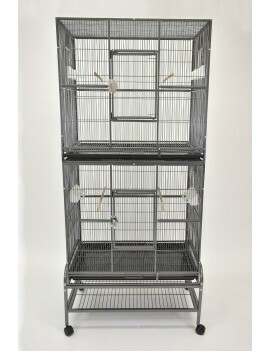 32"X21" Double stacked flight cage for small bird and parrot, such us finch, canary, budgie, lovebird, and cockatiel. It is also good for dove, pigeon, and small animals like sugar glider. - This double stacked flight cage is made of wrought iron, and it comes with sturdy non-toxic powder coating which is guaranteed safe for the bird, and easy to clean. - The double stacked flight cage comes with 4 plastic feeder with internal divider and attached standing perch for easy feeding. - The double stacked flight cage comes with 4 wood perches. - The double stacked flight cage comes with twisting type of lock an extra metal pin on the entrance door for security guard. - The double stacked flight cage comes with slide-out plastic tray and metal grate for easy cleaning. - The double stacked flight cage comes with 4 plastic easy-gliding casters for easy moving. 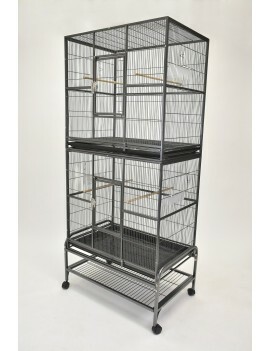 - The double stacked flight cage is suitable for small birds like finch, canary, budgie, lovebird, and cockatiel. It is also good for dove, pigeon, and small animals like sugar glider.